Last month, we got the finale of Scott Snyder, Greg Capullo and company's epic "Death of the Family" story over in Batman #17. It was a beautifully thought-out issue that, truth be told, was so perfect as a closing chapter that you could have stripped away all of the other chapters, began the story with Batman strapped to that chair, and still had one of the great Joker stories of all time just in that one issue. Superman, meanwhile, has been working his way through H'El on Earth, a similarly widescreen story that took place through Superman, Superboy and Supergirl over the course of the last few months. His story, in spite of being fewer parts taking place over fewer titles, hasn't been nearly as tight as Batman's has, and the finale is no exception. The comic is a bit all over the place, with Rocafort's beautiful art being put to disservice by trying to cram so much information onto the page that you end up getting very little that makes sense. Granted, it's taking place during the heat of battle--but we've seen any number of truly epic combat/war zone scenes over the years in comics, and it's rare that you just kind of stare blankly at a page and go, "I think I see what they're trying to do here. I think...". There's also a point where the waifish nature of Rocafort's figure work leaves something to be desired. When you get what looks to be a smack from out of a Three Stooges film, followed by Superboy saying "I've never seen anything hit that hard in my life," it doesn't quite work visually. That ties in with something that was a problem all throughout the issue: there was a lot of telling rather than showing. It's easy to blame the artist for failing to get the visuals across, but considering some of the really purple prose in the narration boxes and some of the really unnecessarily expository dialogue, it seems likely that's a Lobdell problem. That's all craft stuff. There were also a few story points that really seemed odd, to varying degrees. I'll just run down the bullet points, rather than trying to actually analyze any of them much. Cover note: Shay Veritas appears in exactly one panel, where she's basically watching the fight on TV. Also, nobody but Superman ever see the Oracle. Also, the Oracle poses no apparent threat to Superman, Shay Veritas or anybody else. Granted, it's just a cover. So...the heavily-promoted new Oracle is basically Pariah, who we just saw resurface in Vibe? Solid planning. While the Justice League has been present for bits and pieces of this story, it's clear that Wonder Woman is getting a spotlight as a result of dating Superman. That's fine and good, except that it sort of has relegated Wonder Woman to a supporting player in her boyfriend's book--which is most obviously seen on the page where all of the Superman Family characters are talking to each other--and Diana--while Supes is off doing his thing. 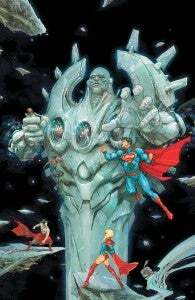 Superboy is "trying to hold time-shards closed"? Isn't that a bit like punching the walls of time? Have we learned nothing? Is Superman an idiot? I understand not wanting Kara to risk her life--and not even necessarily wanting her to kill H'El, since Superman is against killing...but in the final, waning moments of the story, with Earth's only hope just a foot or two away from saving the day, what's he doing YELLING HER SECRET PLAN IN THE VILLAIN'S DIRECTION? The final page "twist" ending has real potential but the rest of the issue/arc has been so underwhelming that I have zero faith Lobdell and Rocafort will be able to capitalize.